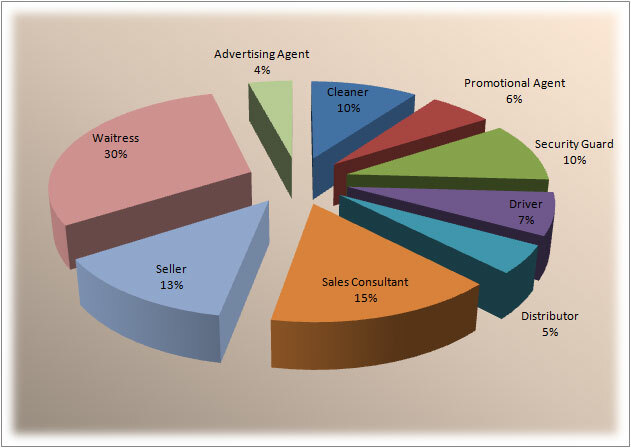 Job portals show most frequently announced low-skilled vacancies in sales (including distribution and promotion), catering and culinary, tourism, security, transport, and cleaning. According to state statistics from 2011, the average unemployment rate in Georgia was only 15.1% (13.1% among working-age women and 16.7% among men), urban unemployment was 26.5%, unemployment in the capital (where the vast majority of jobs are available) was 30.1% and 6.5% in rural areas. The latter figure is due to statistical sleight of hand: the vast majority of the rural population are not employed, but do have small plots of land of their own which are just enough to feed their families at subsistence level and are therefore counted as self-employed (instead of unemployed). This approach "polishes" the national statistics for unemployment to a very significant extent. Overall unemployment is, in reality, significantly higher according to non-governmental survey research by the National Democratic Institute, which carried out a nationwide survey in 2011 using a sample of approx. 17,000 people. 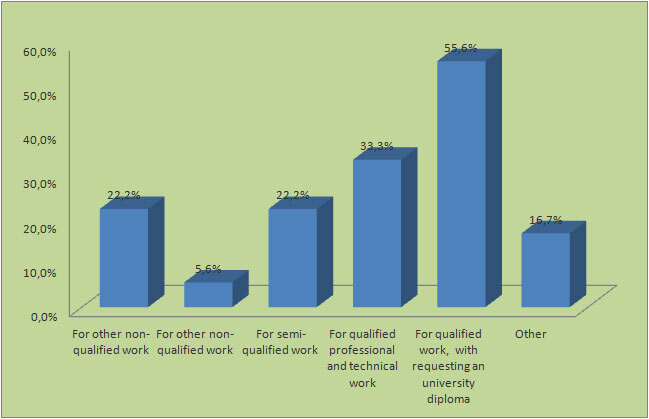 The survey reported 31% of the adult population reporting themselves as being unemployed or seeking employment, 5% no longer looking for work, and 30% non-active labour force (students, housewives, retirees, etc.). These figures increased in a 2013 repeat survey, with 34% unemployed or looking for jobs. The highest combined share of unemployment occurs in the three age groups between 16 and 35 years old (especially high in 18-24 age group), with 71% of them considering themselves unemployed! Furthermore, 17.4% of those working individuals who are formally employed live on 1.25 USD a day which is less than 40% of monthly minimum subsistence allowance for an average consumer. Whether these people can be considered to be gainfully employed is, in fact, open to question. Personal contacts and connections have a significant role on successful recruiting especially in smaller towns – they were the main recruiting method of 61% of employers in Ajara, Autonomic Republic of Georgia according to International Organisation for Migration (IOM) research outcomes. 38% companies find new employees through their existing staff; 18% find it complicated to recruit the right people due to not very attractive work-load and salaries which they offer. Most frequently announced entry-level, semi-skilled and vocational jobs are for cooks, bookkeepers, salespersons, plumbers, waiters, tailors, and various construction-related manual workers (electricians, painters, tilers, etc.). This last group faced a decrease in demand in 2012-2013 due to fall in demand of new construction projects in the residential sectors. However, forecasts expect a significant increase in demand for workers in service sectors like catering, transport, tourism, hospitality, etc. Focus group meetings with young employees and job seekers have been organised for 1) mixed youth from mainly vulnerable social backgrounds 2) only after-care youth. The project team had prepared focus group ToRs and drafted questions to be used as the discussion framework at the youth meetings. The main focus of the meetings was on issues like most frequently offered vacancies, relevance of the skills specified in job announcements with actual practical skills required at the workplace, problems faced at the interviews and pre-employment tests, employers' requirements at workplaces, difficulties encountered and possible solutions found by the youth, etc. 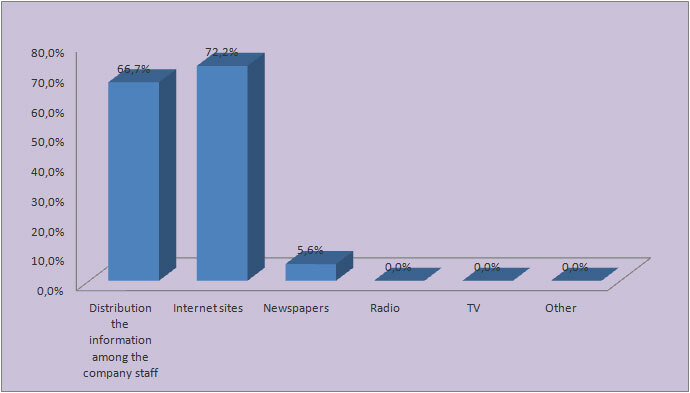 General skills required by the vast majority of employers in their adds were languages, computer literacy and, often, having a driving licence (quite rare assets among vulnerable youth), alongside good communication skills and ability to work under time-pressure. Job interviews turned out to be a stressful challenge for most participants. However, those who had been already interviewed for other positions found the interview process progressively less stressful, as the main questions for the different types of jobs were often repeated. Bad skills in general maths turned out to be quite a problem for some young people – even for applying for low-skilled entry level vacancies, as there were maths tests used during some interviews. Young people mentioned that while some peers fall out from their new jobs very quickly, others stay longer for the reasons like having no other alternatives to go, for being more confident, sociable, communicable, less emotional and physically strong (due to physically demanding work). 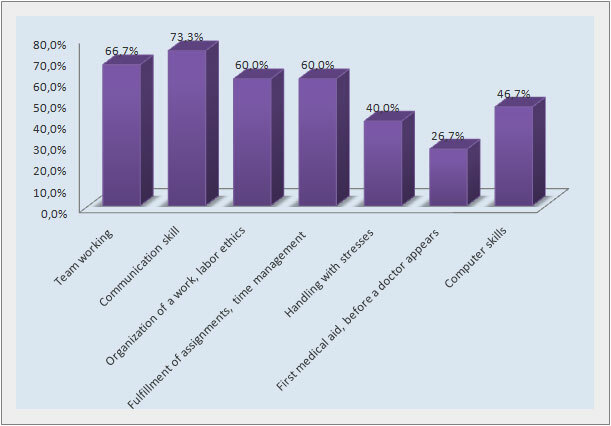 The skills which the youth considered most useful for finding and maintaining jobs were interview techniques, self-confidence, self-presentation skills, office skills, computer literacy and general maths. Many underlined the importance of having relevant vocational skills (not specified) that would be in demand on the labour market, which would offer some stability for their future employment opportunities. Most welcome age group was 25-35 year olds; 18-24 year olds were less welcome. 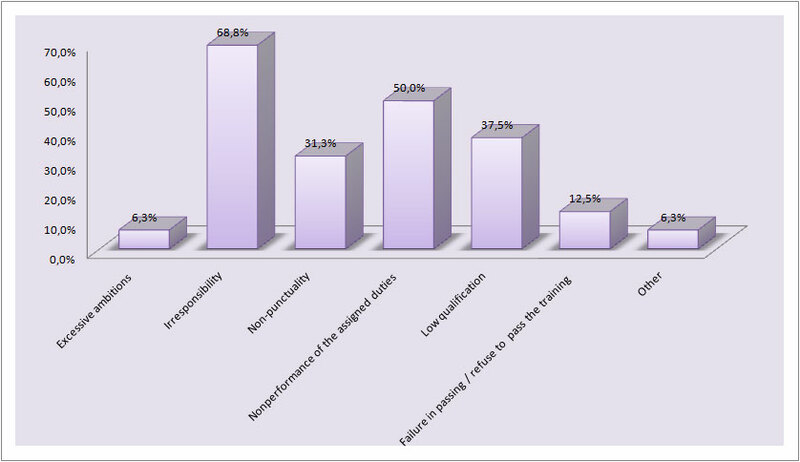 33% of the companies would like to cooperate with vulnerable social groups for vacant positions.. The project team organised face-to-face meetings with relevant governmental departments, NGOs and corporate employers, with particular reference to foreign companies, to assess their specific recruitment requirements for entry-level labour positions and also to seek their input in structuring the training curricula. 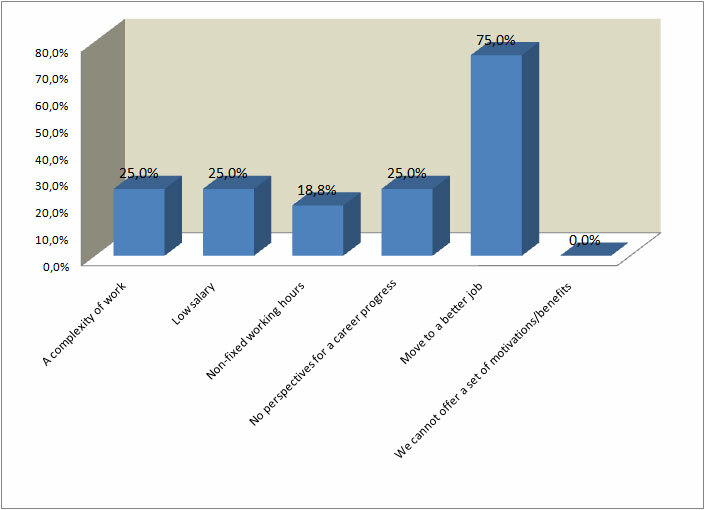 Most of the HR managers met during outreach meetings wanted to know as how "safe" it would be to employee after-care youth and how much they could be trusted with money (one employer even asked for a back-up person with a stable salary who must be financially responsible for any loses possibly incurred as a result of employing after-care youth), whether the youth could handle "workplace stresses" (possible disappointments at work, how they would handle disputes, as well as physical work). Some food production companies mentioned that knowledge and experience of working with food production machinery would be an asset, as well as having driving licenses to possibly hire the youth as distributors. Our observations and preliminary conclusions of the labour market survey for vulnerable youth: With enormous unemployment in the country, a high proportion of vacancies are announced for entry level and semi-qualified jobs, and it is very difficult for the youth who do not have any post-secondary education, specific work experience or references to find their first jobs. In vast numbers of cases, vacancies, job announcements are being circulated internally and/or by the internet. Not having social connections, IT skills or even access to PCs, the vulnerable youth will not have any information about available jobs. Employer requirements, as published in their vacancy announcements, are often very demanding for the actual level and range of skills needed for a prospective job, e.g. as a rule, most job ads ask for not less than university education, fluent foreign languages and computer skills and often for a driving licence even for manual, non-specialised work. Job interviews often include applicants testing in IQ and Maths. General maths is a big challenge for most of after-care youth. Part-time workers /students who need to support their education costs by their own income are considered to leave their jobs often (mainly because of incompatibility of the work load and the studying process). This fact is probably determining the low motivation of companies to employ 18-23 year olds. There is an obvious, but still manageable stigma connected with reliability and honesty of after-care youth among employers, and with the right approach employers show quite some motivation for at least interviewing the vulnerable youth.